CQC inspection: Are you aware of regulations regarding your in-house care home laundry ? These questions can help you establish if, when designing your laundry and processing infectious linen, you have taken reasonable steps to control the risk of cross contamination and infection control in accordance with CFPP0104 and/or EN14065, which are the basis of a CQC inspection. Where is your laundry located within your care home? Is it close to the kitchen or residents rooms? Do you use the same entry point to your laundry for clean and infectious linen? Is your finishing / folding area separate from the area where infectious laundry will be washed ? Do you hang and dry articles in the same room as where you treat infectious linen? Does your laundry have clearly marked and separated Clean and Soiled Areas ? Do you follow the specified bagging procedure for infectious linen? Are the drains in your laundry sealed ? Are they shared with your kitchen and or other services within your care home? Do you conduct periodic decontamination tests using a qualified microbiologist in accordance with EN14698 or EN16616? Have your laundry staff received full training with regards to your laundry ? Are your staff and residents adequately protected from the risks of handling infectious linen ? Have you nominated a qualified individual who is responsible for managing and implementing the above ? 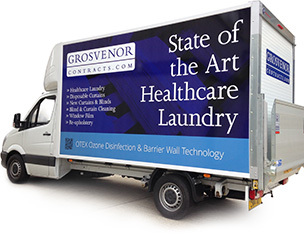 Grosvenor Contracts operate a State of the Art Healthcare Laundry servicing London and the surrounding counties. Please feel free to contact us for further information.